A Fun combination of comedy and aliens in a movie that pretends to take the plot line seriously and is all the better because of it. Independence Day is the movie that proceeded transformers (and came out exactly ten years earlier), as the campy, corny, big budget summer action schlock of our time. It’s not very smart, and the humor is often intentionally cheesy, with characters muttering lines like “check mate,” or “god help us all,” right before the camera cuts to a new scene, but it is still a whole lot of fun. In comparing it to transformers as our 90s version of what that movie has become in the decade that followed, it should be noted that will smith had only one big movie before ID4, which was Michael bay’s bad boys. Since transformers was also Michael bay, it seems very clear that smith was looking for these types of movies, to launch his movie career. It certainly worked. Independence Day is the alien movie that gave us something we hadn’t seen since close encounters, and something that many young people hadn’t seen at all. Aliens and flying saucers attacking earth. 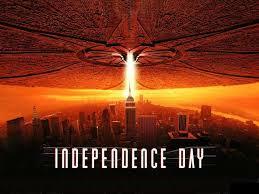 And ID4 tried to make it seem like our time and how things might really go down if it were to happen today. It used the president, scientists, and military pilots as its main characters. It also used a three-day structure of July 2nd and all of the events of that day, followed by July 3rd and then July 4th. That structure worked out pretty well, with giant exploding and destructive events followed by a black screen that would quietly say the new day. There was one moment in particular where on the eve of July 2nd the aliens started destroying buildings and cities, and then we open on July 3rd to see the statue of liberty toppled over, lying in the water. It was a cool image to stand for the morning and the aftermath. I also liked how this movie didn’t just jump right into it with an alien attack the way another movie might. A lot of films believe in getting the audience riled up at the start of the film, and grabbing them from the very beginning. But by doing that, they have not established any characters or reasons to care. This movie is smart in the way it takes its time, starting us only with a small signal that comes in to a satellite monitoring station in the middle of the night, where the lone operator is practicing putting, not even paying attention to the monitors. July 2nd is about the giant ships in the sky and meeting the characters. Will Smith, as a fighter pilot is actually the last of the main characters that we meet. That’s probably because his role is pretty straightforward with no necessary back-story or anything. Other characters, like Randy Quaid as a crop duster who claims to have been kidnapped by aliens, or Jeff Goldblum and his relationship to the president, do need time to establish. Goldblum was married to a woman who is one of the president’s assistants and had a moment of jealousy, before bill Pullman became the president, where Goldblum sensed an affair was happening and punched Pullman out. And all of that is just back-story. The back-story of the characters goes a long way in this movie towards grounding the characters in reality. There’s so much madness that will be taking place throughout the film, that it’s nice to have some realistic characters with real problems that we can experience the alien stuff with. I also like that the movie tries to offer up ideas and solutions instead of sticking only to action. Goldblum comes to a realization on day one. He notices that the aliens are using our own satellites to communicate with each other. The Planet earth is blocking their signal, so they need to go around earth, to the satellites, to keep in touch with one another. 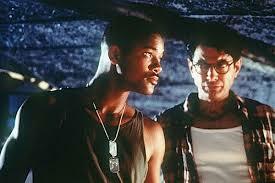 Goldblum is even able to pin point exactly when the aliens will attack. The movie gives us the moments leading up to this attack in a countdown digital number situation, on Goldblum’s lap top, and it actually uses the digital number countdown again at the end with a bomb dropped off in a spaceship. The reason I mention it is because a digital clock counting backwards is a cliché and a little silly, but this movie doesn’t mind being corny and mainstream oriented, and so those countdowns do work for this movie. On July 3rd, the pilots try a counter attack and we get dogfight scenes through the air as alien ships chase down American aircrafts. We also get brought inside a secret sector of the government, area 51, which is pretty cool. I love that the movie doesn’t keep everything outside in the open with ships flying around, but takes the time to bring us indoors to get a good look at these aliens. The area 51 scenes are some of my favorite in the movie, with Brett Spiner appearing as a mad scientist who has devoted his life to studying these creatures. And on July 4th, we fight back. Goldblum has another idea and he makes it work. He gets help from will smith. And while those two guys are going up in an alien ship and taking it into the mother ship, Bill Pullman is leading an air strike from outside the alien structure. He’s the president and now suddenly he’s an action hero. It’s a little silly, but the movie doesn’t care. It wants to end the movie with individuals and so we get four men, Smith Flying the thing, Goldblum manipulating the electronics and computer systems, and Pullman and randy Quaid leading the air strike outside. Everything in this movie can either be seen as silly or fun. And the truth is, everything in the movie is both. The speeches are campy as are the many one-liners. And the action is ridiculous, but still pretty cool. For me, the best thing about the movie is the way the characters react to all that is going on around them. I love the Jeff Goldblum character because he seems the most grounded in realistic solutions. Like when he goes to the white house and triangulates his ex-wife’s cell phone signal to figure out exactly which white house window she is closest to. And then he gets near that window so that when she looks outside she will see him. Moments like that have nothing to do with aliens, and yet they are an integral part of the film because they help ground it in reality. It’s a fun, silly movie that became a monster success because it offered up nothing more than pure entertainment. Sometimes that’s exactly what people want to see.